Nestlé CERELAC has been around for 150 years and is a trusted brand to many parents, myself included! Back when I first had Kylie 5 years ago, we started her on Nestlé CERELAC as a first food since it was recommended by her infant care teachers. I was a new and very young mom then and I was pretty much clueless so I heeded the teachers' advice because I knew that they would know better. 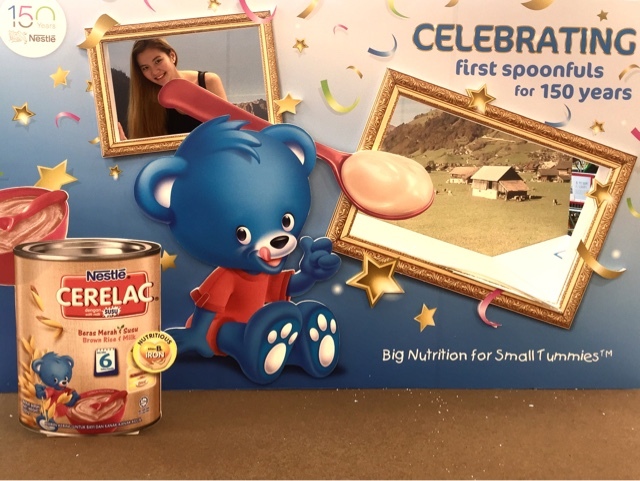 Fast forward 5 years and this time, I chose to start Megan on Nestle CERELAC myself because I now know of the nutritional benefits plus, the convenience and ease of preparing it! A couple of weeks ago, I went down to the Nestlé CERELAC roadshow to learn more about Nestle CERELAC and how they first started! Not many know this but Nestlé's first product they worked on is actually baby food! Way before the delicious Nestlé chocolates we know came about! Founder, Henri Nestlé was determined to find a way to reduce child mortality back in the 1860s so he began to look into providing nutritional solution and thus we have what we have today! Nestlé Cerelac, 150 years of research into baby food just so we can provide the best for our children! I know there are a few who would frown at the idea of giving an infant "food from a box" but for me, I don't feel a tad guilty when I give Megan CERELAC because they use only natural ingredients. And as mentioned, even her infant care and I'm sure many other infant cares as well, trust Nestle CERELAC enough to include it into their daily dietary menu for the kids. Of course I wouldn't recommend that you give only CERELAC to your child for all three meals a day because I believe at children should be introduced to a variety of different foods but it certainly is a quick and easy supplement as well as a great first solid food to start with! Not many of us are able to provide home cooked meals for our children everyday so Nestlé CERELAC stands as a really good supplement in ensuring that my baby is well fed and well nourished! 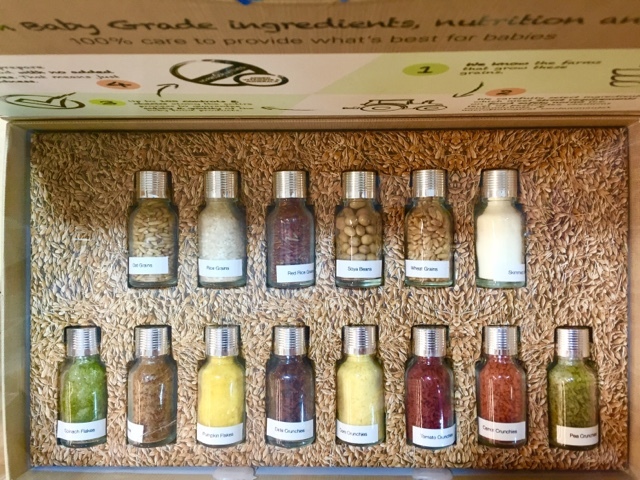 The baby cereal comes in a wide variety of flavours ranging from plain Rice for starters to Wheat & Honey and even multiple ingredients like Multi Grain & Garden Vegetables for the older babies! What I love most about their cereals is how quick and easy it is to prepare! Simply scoop your desired amount of cereal into a bown (ideally 5 tablespoons to 150ml of water but the amount varies dependng on how much your baby can eat). Gradually add cereal to water. Stir until cereal is smooth. & voila! It's ready to eat! Just within minutes! Megan really loves her cereal and can polish the entire bowl in less than 15 minutes! Super fast eater this girl! Apart from CERELAC, Nestlé also has another range of baby food that I'm sure you've also come across before - Gerber. Gerber's juices are 100% natural and made from real apples with no artificial colours, flavours or sugars added! You literally can just grab a bottle of the shelf and you're good to go! They also have purees in a bottle that's also made from real food that you can either heat up or serve straight from the bottle! One of my favourite Gerber products are their Graduates Puffs cereal snack! I've tried them myself and even I love the flavour! They have it in 4 delightful flavours - Strawberry Apple. Banana, Sweet Potato and Peach. We've tried the Banana and Strawberry Apple one so far and the kids really love it! Kylie ALWAYS steals her sister's Graduate Puffs cereal snack and ALWAYS helps herself to half the bottle! But I'd gladly let her have this healthier alternative compared to candies! Gerber’s Graduate Puffs are made from whole grains, has 90% less salt and 15% less sugar compared to regular, non-organic biscuits so you can ensure guilt-free snacking for the whole family! Admittedly, even I snack on a handful of puffs myself every now and then! I think adults can consider snacking on these instead of unhealthy potato chips too! The puffs are really light and they melt in your mouth so it's a really great start to introducing your child to self-weaning and also to develop their fine motor skills. I'll be giving 3 of my readers a Nestlé hamper worth $50 that includes all the products show below! All you have to do to be entitled for this giveaway is to head over to my Instagram (@estherachel) hit the follow button, like and tag three friends on this Nestlé IG post as shown below (link)! Winners will be announced on 31st August 2016! So go ahead and spread the love! Meanwhile, you can headover to www.nestlebaby.com.sg to find out more about their products!